Solar thermal energy is a technology that harnesses energy from the sun (solar energy) to generate heat, or thermal energy. Solar energy is gathered through highly efficient receivers/collectors and moves through a thermal liquid, which stores the heat (energy). 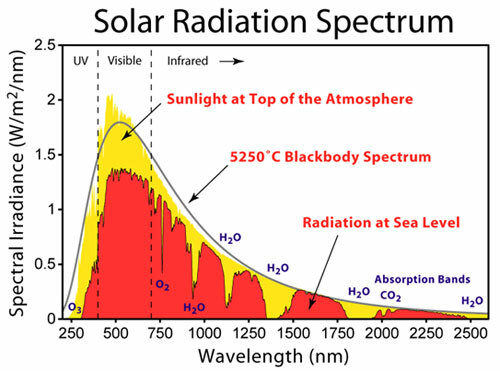 Solar thermal energy is different from photovoltaic, which convert solar energy directly into electricity. As new solar thermal technologies continue to move from the conceptual to application stage, the solar thermal industry is growing quickly, attracting involvement from big names in energy like Siemens, PG&E and large corporations like Google. This benefits consumers because as solar thermal technology advances, the price of providing this energy drops. 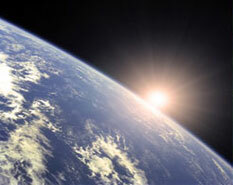 Solar thermal power currently leads the way as the most cost-effective solar technology in large-scale applications. The latest generation of solar thermal technology, concentrated solar power, used for the large-scale production of electricity, offers the promise of even larger scale environmental benefits. In its simplest form, a concentrated solar power plant consists of solar collectors (mirrors or parabolic dishes), that collect heat to transform water to steam, which in turn provides force to move electricity generating turbines. The environmental benefits are obvious. Emissions from steam generated electricity share little in common with their cousins, emissions from fossil-fueled generated electricity plants, the primary causes of air pollution such as smog, acid rain and climate change. Solar water heating systems for industrial, commercial and residential use typically consist of solar receivers and a collector, which gathers the sun's heat and transfers it to water passing thought the plumbing system on its way to a hot water storage container. Solar water heating systems save money by reducing the electricity costs associated with traditional water heating. They are also environmentally friendly because saving electricity also means avoiding the pollutants associated with electricity production or burning natural gas. 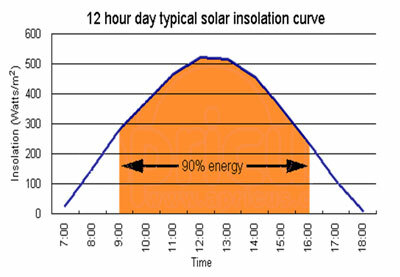 There are currently two methods for solar thermal collection. Line focus is less expensive, technically less difficult, but not as efficient as point focus. The basis for this technology is a parabola-shaped mirror, which rotates on a single axis throughout the day tracking the sun. The point of focus in a line focus mirror array can only reach temperatures around 300°C. Point focus, though initially costlier and technically more nuanced. The point focus technique requires a series of mirrors surrounding a central tower, also known as a power tower. The mirrors focus the sun's rays onto a point on the tower, which then transfers the heat into more usable energy. A solar thermal collector is specifically designed and manufactured to collect heat; that is, to absorb sunlight and convert it to heat. Although the term is commonly being applied to commercial & residential solar thermal collectors, it is also used to denote installations that are more complex. Solar thermal collectors are commonly segmented as low-temperature, medium-temperature, or high-temperature receivers. High temperature receivers concentrates the sunlight using parabolic troughs and/or mirrors or lenses and are generally used for electric power production and large industrial processes. Medium-temperature collectors are also usually used for creating hot water for residential and commercial use. In the northern hemisphere, evacuated tube collectors should be installed pointing towards true south (or 0o). This is, however, not the same as magnetic south (or the south that your compass shows you). This difference between magnetic south and true south is called the azimuth. Depending on the longitude of your location (direction East and West) determines your azimuth. Azimuth is different from location to location, and you should align your solar collector on the azimuth for optimum performance. In addition, solar collectors must be installed at the right angle in order to ensure that they perform with the highest possible efficiency and deliver the highest returns on investment and the shortest payback period possible. The optimum installation angle for solar collectors is your latitude (your position North-South) plus 15 degrees. For instance, you live at 30 degrees North Latitude; your solar collectors should be installed at 45 degrees – 30 degrees plus 15 degrees.